Belfast City Hospital approached the QUB School of Psychology to look at widening participation through non-traditional career pathways. Regular meetings with the school helped to establish respective resources, aims, objectives and practicalities. RAMHIF then proposed a unique and very productive study around exploring the impact and effectiveness of RAMHIF on site wellbeing initiatives for construction workers. This study aimed more specifically to look at barriers to the uptake of initiatives and key actions to address and engage more site workers in well-being activities. The study would not only benefit our operatives, but also meet the school’s aim of widening employee opportunities for 3rd level Psychology students by offering new opportunities within the construction industry to students who had never been exposed to it before. As a regular support to our wellbeing calendar in a range of services, Cancer Focus NI were invited to become a key partner. 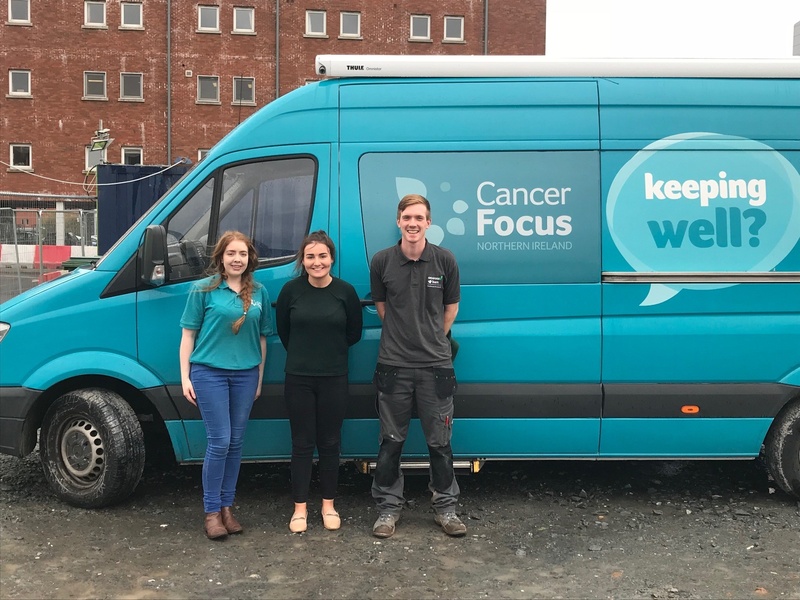 After assessing all of the options, it was agreed to focus the study on the impact of the Cancer Focus NI Keeping Well Van Service which has been coming to the site for many years. Conducting interviews with operatives and senior management to understand the construction industry, the daily working environment and how health and wellbeing initiatives are implemented. Conducting interviews with GBHP senior management and the impact on organisation and wider impacts of health initiatives. Developing pre-van questionnaires to establish expectations and motivations of participants in advance of the arrival of the van on site. Exploring the barriers as to why operatives do not take up this opportunity. Conducting post-health check interviews with operatives to gauge reactions. Conducting follow-up interviews with the same participants to assess the impact and to see if the visit had made a difference. The impact of the Keeping Well Van on construction operatives. Monitor Report. Graham Bam Healthcare Partnership. Northern Ireland. October 2018. Occupational health is important to make sure operatives are fit for the work they are doing and to prevent their work from affecting their health. Provision is a demonstration of a caring and professional company and will help attract highly qualified recruits. Worker welfare has become more important in regards to long term health, fewer accidents and absenteeism.